The arm pain is reported by the patient himself. The causes are many and varied. The arm pain can be a symptom moving towards a potentially serious disease (angina pectoris, arteritis, phlebitis, inflammatory myositis, vasculitis …) it will find and diagnose. 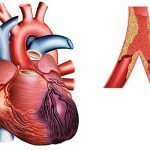 The main emergencies are acute ischemia (by atheromatous thrombosis or embolism), deep vein thrombosis, angina. Again, examination and clinical examination often provide the key to diagnosis. The arm pain (usually the left arm) is accompanied by chest pain médiothoraciques, constrictive. Irradiation to the jaws may be. Pain can arise de novo, at rest or on exertion. It is often described as intense. It occurs most often in adults over fifty years with several cardiovascular risk factors (smoking, hypertension, diabetes, high cholesterol, age, early family history of coronary heart disease in the first degree, metabolic syndrome) or heart disease Already known. The ECG is essential, if possible per-criticism. Its normality does not question the diagnosis. Support is urgently discussed in that chapter. Acute ischemia of the upper member causes arm pain in the context of a diffuse pain of the upper limb. The member is cold, pale, painful. The cit muscle and sensory challenge is the severity of the table. The pulse rate, in particular radial and ulnar, are not found in the examination and Pocket Doppler. The patient should be admitted to emergency via EMS in vascular surgery. Treatment pending must include a bolus of 160 to 250 mg of aspirin, heparin and effective analgesics. An ECG is imperative urgently to avoid missing a myocardial infarction associated. Acute ischemia can occur either on healthy arteries on the occasion of an embolism or thrombosis on progression of the atheromatous plaque. The symptoms are primarily an arm pain with clinical aspect of thugs, dilatation of the superficial venous system.Edema is changing the back of the hand to the whole arm. The pain can be significant or limited to a feeling of heaviness or discomfort in the arms. The examination may find an indurated cord corresponding to the axillary vein thrombosis. There may in the case of thrombosis of subclavian vein collateral venous circulation chest and shoulder with a filling of sub-clavicular hollow. The positive diagnosis is made by the Doppler: visualization of the thrombus and incompressibility of the vein. Retro subclavian portion of the subclavian vein is not seen in the Doppler ultrasound, but only on the scanner. With no obvious cause, the scanner will search neoplasia. It will also be useful for finding a subclavian thrombosis unseen because of the collarbone. Complications are various; first pulmonary embolism. Septic phlebitis occur in intensive care on catheter. Venous gangrene is seen especially in advanced cancers (death in 50% of cases and amputation in 50% of cases). 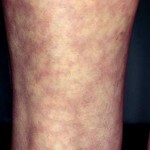 The aftermath type of post-thrombotic syndrome is mostly seen in young subjects, in the group of primitive phlebitis (anatomical conflict). 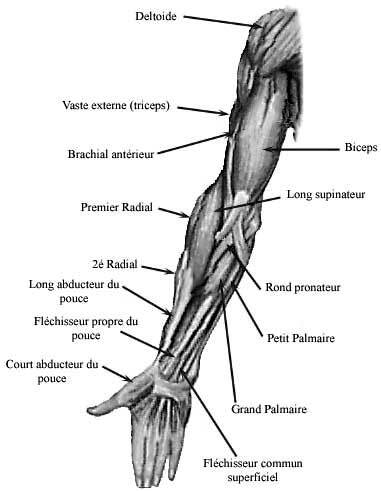 This is the arm edema, pain and fatigue at effort, collateral venous circulation or paresthesia. This is phlebitis axillary-subclavian occurring in the young subjects aged 35 after an effort (eg in sports). There is a conflict at the anatomical challenge lé thoracic outlet. Stress is often done in the arm hyperabduction or carrying heavy loads. Catheters are cancers with the most powerful risk factors for deep vein thrombosis of the upper extremity. The risk associated with the presence of a pacemaker is much lower. The cancers in question are gastrointestinal, hematologic, lung and breast cancers in women in the presence of a catheter. In his absence, it is especially breast cancers, lung and lymphoma. Cancer metastatic character is a powerful risk factor. These are constitutional or acquired coagulation abnormalities (eg antiphospholipid syndrome; defi cit antithrombin) already discussed in the chapter on thrombosis. The presence of another risk factor is a contributory factor. 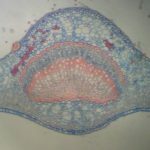 Another example is Behçet’s disease. Pregnancy is a prothrombotic state. These capabilities include the jugular thrombosis related inducer of ovulation. 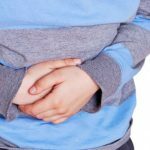 A context of ovarian hyperstimulation syndrome occurs most often. In pregnancy after this treatment, thromboses occur early, about the 7th week. 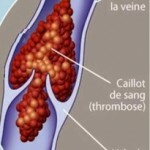 They are also those found in other types of deep vein thrombosis. Include the combined oral contraceptives and smoking association and local factors: capital arm, trauma, locoregional surgery. Treatment is best in hospitalization in a specialized environment. Treatment includes effective anticoagulation for at least three months. Initially it is based on use of heparin low molecular weight relayed by AVK. In case of active cancer, especially if recurrent thrombosis under AVK, is best left LMWH in fear of Trousseau’s syndrome. The duration of anticoagulation in the presence of the catheter is to be discussed case by case (usually as long as the catheter is left in place). 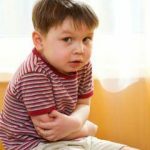 In young subjects, in case of phlebitis of effort, some have proposed a more aggressive treatment protocol. It includes a fibrinolysis then three months of anticoagulant therapy followed by resection of the first rib possibly angioplasty of the subclavian vein. This is a specialist business. Most often, if the challenge lé syndrome thoracic outlet, if it persists remote symptomatology of treatment, physical therapy is proposed. It is only in case of failure of the latter that surgical resection of the first rib is envisaged. It occurs in a patient over the age of fifty, often male, with cardiovascular risk factors (smoking, hypertension, diabetes, high cholesterol, age, family history of premature coronary heart disease in the first degree, metabolic syndrome). There is often a lower limb arteritis. It is usually accompanied by a ipsilateral Raynaud’s syndrome. The blasts on arterial routes will be searched. The Doppler ultrasound remains the first step of diagnosis. The angio-CT, MR angiography or arteriography will be considered secondarily by the specialist. Chronic stadium management is that the overall atherosclerotic research and correction of cardiovascular risk factors, antiplatelet, search other locations of atherosclerosis (carotid and breath Doppler ultrasound of TSA; angina pain ECG; arteritis). The syndrome of the web thoracic outlet challenge results in fatigue of the arm with force ischemia, especially in abduction and elevation movements. Postural and dynamic disturbances is very important worsening in the raising of the arm with heavy feeling, when carrying heavy loads … The signs predominate in hand and forearm. The symptomatology is both vascular (cold, pale hand, appearance of axillary breath, loss of pulse during dynamic maneuvers) and neurologic (paresthesia related to compression of the brachial plexus, especially in the C8D1 territory loss muscle strength, clumsiness of the hand, late atrophy). Other symptoms are fatigue positional, symptoms suggestive of carpal tunnel syndrome, a permanent or intermittent arm edema, Raynaud’s syndrome, phlebitis of the upper limb (see the arm of phlebitis). There is a female predominance. The notion of triggering position (arm elevation hyperabduction) may be related to an occupational cause (teacher, painter, mechanic …) and leisure (tennis, gymnastics, judo …). The most useful clinical maneuver is one of the candlestick. Patient standing with your back against a wall. It puts the upper limbs in position “high hands”. The hands are in constant contact with the plane of the wall. He realizes flexion-extension movements of the fingers for one minute. A violation of the subclavian artery results in a syncopal phase and functional impairment of the upper limb for thirty seconds. One can also use a variation of this maneuver by putting the arm in elevation, abduction elbows bent and asking the patient to block the inspiration. We can then see a disappearance of the pulse or alarm symptoms. Adson maneuver consists of performing ipsilateral rotation-extension of the neck, when the positive pulse is abolished or the symptoms reappear. Static and dynamic Doppler ultrasonography is the fundamental review. Radiographs of the cervical spine research a supernumerary coast. The electromyogram mainly contributes to the differential diagnosis. Treatment is primarily physical. Avoid movements and positions causing the onset of symptoms. Physiotherapy is fundamental to open the costo-thoracic lé challenge and costoclavicular clip. Removal of the first cervical rib is made in resistant cases. An array of claudication of the upper limb may also be in the syndrome subclavian artery thief. A intermittent claudication, rajouteront are visual signs, headache, dizziness or discomfort. The syndrome is due to stenosis of the subclavian artery upstream of the ostium of the vertebral artery. Then there will be a reversal of the vertebral flow in case of stenosis, increased by muscle member. There will be an asymmetry of blood pressure with a blood pressure of the affected limb and an asymmetry of the pulse. The diagnosis is made by the vascular Doppler ultrasonography with dynamic maneuvers. The arteriography will confirm the diagnosis. They can rarely give a pain in the arm type of intermittent claudication. The mechanism is a violation of the aortic arch vessels or for the upper limbs. Most often, the arms of the pain is bilateral. Arm pain is pain type of intermittent claudication of the upper limb. The young woman (less than fifty years) is usually reached. The pains occur during the occlusive phase of the disease. There is asymmetry in the review of a pulse and blood pressure in both upper limbs. Raynaud’s phenomenon can be observed. A breath subclavian or abdominal aorta should be sought.Spondylarthropathy and a history of tuberculosis should be sought. Symptoms of pre-occlusive phase are here fickle fever, polyarthritis, myalgia, mono or arthritis, effusion pleural or pericardial nodosum … Symptoms suggestive of ischemic central nervous system should be sought. Amaurosis or scotoma will involve risk of blindness. There may be a secondary bending neck vascular insufficiency. High blood pressure, heart and lung disease should be investigated. The inflammation is inconstant. The angio-CT or MR angiography, arteriography showed localized arterial stenosis, aortic occlusion, a saccular aneurysm. The coexistence of achievement in several arterial territories, the estate of ectasia and strictures and the particular topography violations are evocative (post-vertebral subclavian, carotid primitive, axillary-humeral axis). There is a circumferential thickening of the vessel wall for a visible inflammatory disease in Doppler ultrasound. This can highlight a violation of the subclavian artery in his post-spinal portion with stenosis and dilatation post-stenotic aneurysm. There may be other disorders of the large arteries. The patient should be entrusted to specialist to do the mapping of damage and to initiate treatment. This is usually based on systemic corticosteroids, initially at 1 mg / kg / day and then decreasing. In case of no improvement, immunosuppressive therapy is proposed: azathioprine or methotrexate more often. The treatment of other disorders (eg hypertension) is nonspecific. Surgical treatment or angioplasty is the domain of the specialist. It affects the upper and lower limbs. It gives intermittent claudication effort. There may Raynaud’s phenomenon, often unilateral. 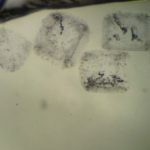 This is often severe with trophic disorders, sousunguéales bleeding, asymmetrical, can not touch one or two fingers. The maneuver Allen is often positive. The male young (thirty) heavy smoker is reached. Claudication of the lower limbs in particular its distal side (reached the foot), the presence of paresthesia and superficial phlebitis are suggestive. Doppler ultrasonography and angiography contribute to the diagnosis by showing a small part of aorto-iliac-femoral axis (amputations segmental artery and distal lower limb with appearance of collateral circulation in vine tendril). The management is based first and foremost on stopping smoking. The antiplatelet are offered throughout the course.Treat relapses based on intravenous infusions ilomedin in hospital. Tumors can affect young subjects (eg Ewing’s sarcoma in children) or older (eg metastasis). Tumors can be bone (metastasis, osteosarcoma …) or developed at the expense of soft tissues (e.g. rhabdomyosarcoma …). The review looks for personal and family history, including oncologic, exposure to toxic substances (alcohol, smoking, occupational exposure …). The exam can find a bone deformity or swelling subcutaneous sensitive. Imaging tests (standard X-rays, CT, MRI, scintigraphy) confirm the diagnostic suspicion which usually requires histological evidence.The management is both specialized (different depending on the type of tumor with surgery, radiotherapy, chemotherapy see targeted therapy) and symptomatic (analgesics, anti-inflammatory drugs or not …). 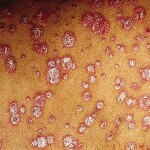 Erysipelas is a cause of pain in the arm, the diagnosis is obvious. It is rare that the arm leg. It is seen especially in patients who underwent ipsilateral axillary dissection, mostly for breast cancer with secondary lymphedema. The arm is red, hot, painful. Fever is present, usually moderate. The front door should be sought carefully to the upper limb. It is usually minimal. The search for a chest inflammatory closet is imperative. Support is given in the “erysipelas”. The patient complains of a sharp and acute shoulder pain radiating down the arm and forearm. The pain disappears in a few days to weeks. It appears secondarily a hypoesthesia atrophy with reaching several muscles of the shoulder (deltoid, rotator cuff, biceps, serratus.). The etiology of this rare Amyotrophic neuralgia is unknown. The arm pain is neuropathic here. The patient will complain of continuous pain or paresthesia type electric shock or lightning painful. They follow a neurological systematization according to or damage the roots. The arm pain is accompanied by pain in the elbow, forearm and hand depending on the level of neurological involvement. All brachial plexus injury and roots can cause such pain. Causes include trauma (eg, accident of the public highway) and in particular the cuts (eg, during sleep or secondary to overdose), neoplastic causes (including a lung cancer with Pancoast- apex syndrome Tobias). The etiological treatment is first. Symptomatic treatment can call in case of continuous pain antidepressants (amitriptyline, Laroxyl®, 12.5 to 25 mg / d, against indicated if infarction, glaucoma angle closure, risk of acute retention by urine bladder and prostatic obstruction, hypersensitivity to the product and association with non-selective MAOIs) or in case of painful paroxysms to antiepileptic (Tegretol, carbamazepine, II to V drops per day in most cases, against indications cases of atrioventricular block, known hypersensitivity to carbamazepine or to any component of the formulation of myelosuppression a history of acute intermittent porphyria, association saquinavir and voriconazole).Gabapentin (Neurontin 300 mg orally to slowly build up more often up to 1200 mg contraindicated in case of allergy, adjust doses according to renal function) and Lyrica (pregabalin starting dose 75 to 150 mg / day if necessary to increase gradually to 300-600 mg cons-indicated in cases of allergy, adjust doses according to renal function) are effective on both types of pain. The pain is felt in the front of the upper limb. She left shoulder and radiates along the biceps to the forearm. The abduction and internal rotation of the arm are painful. Palpation of the bicipital groove is sensitive. The pain can be caused by the upset supination of the forearm on the arm to 90 °. In the elderly, the tear can be diagnosed before a persistent swelling biceps. In young subjects, in case of tendon rupture, surgery is necessary. In other cases, treatment is medical combining analgesics, nonsteroidal anti-inflammatory drugs, physical therapy and management of contributory factors. They mainly affect the upper end of the humerus or humeral. The diagnosis is usually obvious lameness with pain and deformation of arms, unable to mobilize position with upper limb trauma. The fracture is secondary to violent trauma in young patients. In the older subject, it may be a less violent trauma, a fall from a height, for example. Keep in mind the possibility of revealing a fracture bone disease (eg, osteosarcoma, metastases …). The patient should be sent to surgical emergencies. It will search for complications (damage in the territory of the radial nerve, skin opening, large hematoma with secondary deglobulisation, vascular lesions …). The compartment syndrome is much less common than the lower limbs. The treatment can be orthopedic (Dujarier, cast for) or surgical (nailing, plate, external fixator …). They are usually secondary to a brachial plexus injury. The trauma involved is often violent (for example, the highway accident). The plexus lesion is then often accompanied by other injuries, bone or muscle. The diagnosis of arm pain then joined the widespread pain (see the polyalgia). The arms of the pain is then integrated into the framework of generalized myalgia. They are bilateral. Muscle pain predominate the scapular and pelvic girdles. They are inflammatory times as possible nocturnal occurrence, morning stiffness greater than 30 minutes. They are responsible for muscle weakness it will seek and rate, to determine the severity of the disease. In case of dermatomyositis, it will look for skin lesions: erythema periorbital purplish rash on sun-exposed areas, Gottron’s papules on the hands (next of the joints), knees and elbows, erythema periungual painful (sign of the nail). In adults, a cancer should be sought (with clinical pelvic examination, pelvic examination and mammography in women, thoraco-abdominal CT scan, determination of PSA in men, digestive endoscopy, ENT examination …). The patient should be given for taking initial hospital treatment. Biologically, muscle enzymes (CPK, LDH, aldolases) are high. There are anti-nuclear factors with mostly speckled fluorescent antibody (anti-PM, anti Ku, anti-Jo-1, anti-SSa, anti-SSb …). The electromyogram shows a myogenic syndrome. Muscle MRI may show a pathological muscle hyperintensity. Muscle biopsy is needed to confirm the diagnosis of inflammatory myositis and its subtype. The management is based primarily on systemic corticosteroids (initially Cortancyl® 1 mg / kg / day orally). They are treated in Chapter polyalgia. The pains are not the systematization of infl ammatory myositis. They occur most often in the effort with cramps.Thyroid dysfunction should be eliminated. The presence of other diffuse disorders (diabetes, Ophthalmological, family history …) associated with myalgia effort should be suspected mitochondrial cytopathy. Specialist advice is needed.Violations of drug-induced should be systematically sought for questioning. They can occur at rest or during exercise.Taking statins is often involved. Myalgias may persist for weeks to months after discontinuation (myopathy underlying revealed by taking statins should be sought in case of prolonged persistence). The arms of pain are often bilateral. 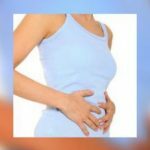 They fit in the context of widespread pain, often accompanied by asthenia with psychological repercussions, a functional bowel disorder … Fibromyalgia occurs almost exclusively in women. On examination, there are sore spots.Seniority symptoms, field occurrence, the lack of impact on the general state confirm the diagnosis. Treatment is difficult and often disappointing. The arms of pain now appear in a context of polymyalgies and polyarthritis with fever. There is often a concept of contagion (seasonal epidemic winter contact with young sick children …). The diagnosis is usually obvious. Clinical examination revealed most often pulmonary symptoms (cough in the context of a bronchitis …) or gastrointestinal (diarrhea …). The evolution is usually favorable spontaneously. Treatment is symptomatic: hydration, analgesic-antipyretics such as paracetamol 1g x 3 per day orally. Then the arms of pain are often bilateral. They are usually accompanied by pain in the shoulder girdle. The schedule is inflammatory pain, with nighttime awakenings and morning stiffness greater than 30 minutes. Affected individuals have over fifty years. Clinically, there is a pain in mobilizing muscles scapular and pelvic girdles. In particular the elevation of the shoulders is difficult. Horton’s disease can also cause pain in the arm by a breach of the aortic arch, or the vessels of the upper limb with an array of intermittent claudication of the upper limb. Signs for a GCA will be searched: headache, pain scalp when passing the comb or installing curlers, jaw claudication, fever, poor general condition. An inflammatory syndrome is most often present. If signs in favor of Horton’s disease, treatment should be started immediately. The biopsy of the temporal arteries should be performed secondarily, best in hospitalization. Treatment consists of taking corticosteroids. A specialized care is needed. For individual PPR classical dose is 0.4 mg / kg / day but a dose of 20 mg daily Cortancyl® is often sufficient. If GCA, corticosteroid therapy will be initiated at 1 mg / kg / day orally in the absence of ocular signs. In this case, steroids bolus (Solumedrol®) must first be performed (500 mg to 1 g / day for three consecutive days).